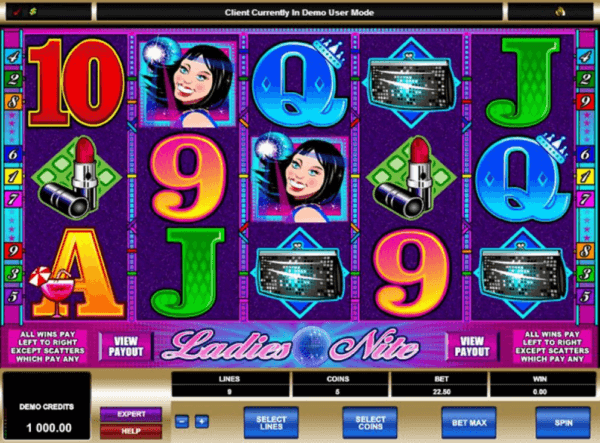 Ladies Nite is awesome Microgaming pokies game of 5 reels and 9 payline with a girlish theme having nice bonus features where you can win a jackpot of 10000 coins. The design of the Ladies Nite game is in pink and blue colours, which create the perfect atmosphere for such game. So, on its reels you will see the dancing girls, the cocktail, the perfume bottle, the purse, the lipstick, the glitterball, the waiter and A to 9 card symbols. The Wild symbol of this game is the Glitterball icon, the necessary attribute of every party. The value of this Wild symbol increases here, because it serves as the 2x multiplier of all winning combinations, in which it takes part. The Ladies Nite casino pokies game has one bonus round. There is the Scatter symbol which is the Waiter, where combinations allow you to play 15 free spins. All wins during this feature will be subjected to the 3x multiplier and you can get more free spins with the appearance of at least three Scatter symbol again on the reels. Scatters also have high payouts and, for example, in the Ladies Nite five Waiter Scatters you can receive 500 coins. In this energetic game there is also the Gamble feature, where you should guess the correct colour or suit of the card to multiply your wins by 2 or by 4.